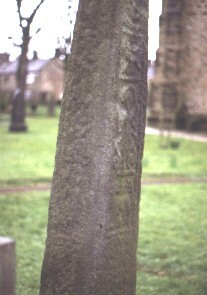 Cross Shaft fragment, south and east faces. The south face has interlace. There is a figure in the centre of the east face. There are two serpents in the panel with him. He has been identified as Christ (Hawkes). Above him there is a panel with a bird. Below him there is a panel containing an animal. He is facing left, but his head is looking back to the right. Collingwood, W.G., Northumbrian Crosses of the pre-Norman age 1, Faber and Gwyer, London (1927) Stones, Crosses, Anglo-Saxons, England..